Hey, you… yeah, you over there on the couch! What was it you said this morning? You were “too tired” to exercise? Or you “didn’t have enough time”? Or “it hurts”? Come on. Seriously. You have no excuses anymore, and you know why? Apparently, paleontologists have discovered the remains of an ancient fossil fish that shows shocking signs of—get this—ripped abdominal muscles. Look, if a fish from 380 million years ago could do it? You can too. Nobody wants to get shown up by a fish. But seriously, it was previously thought that only land animals developed abdominal muscles, but Gogo fish fossils found in the Kimberly region of Western Australia are causing scientists to question what they previously knew about muscle development in ancient creatures. Did the abs found in the ancient fish serve the same function as they did in land mammals? It’s hard to say. 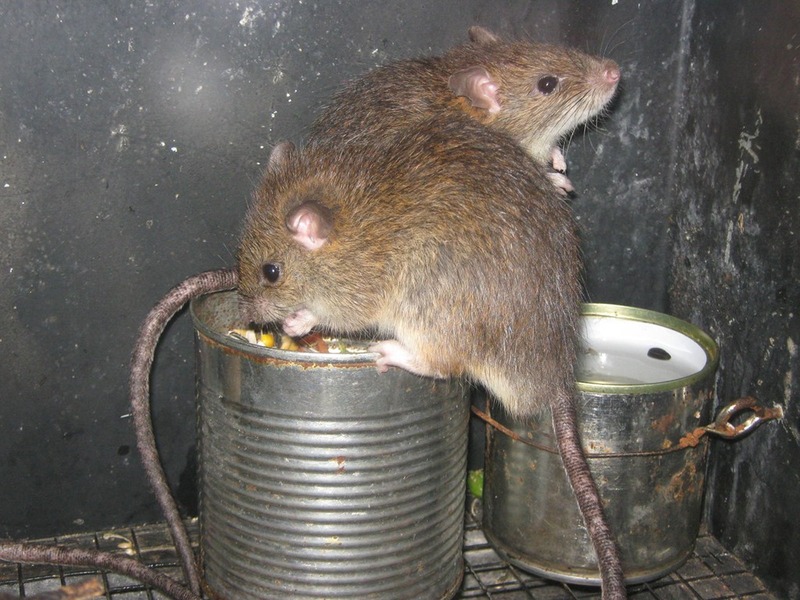 It’s also strange because for fish, “their main mode of propulsion is of course to flap their tails to left and right so all the muscles are sitting on the side of the body",” says Gavin Young (of Australian National University’s Research School of Earth Sciences). A study on these ripped fish was published in Science, which mapped the musculature of the ancient fish for the very first time—and this was only possible because researchers discovered that some of the specimens still had preserved elements of soft tissue! The fossil fish are considered Placoderms, which have often been compared with sharks, but not even sharks have abs. 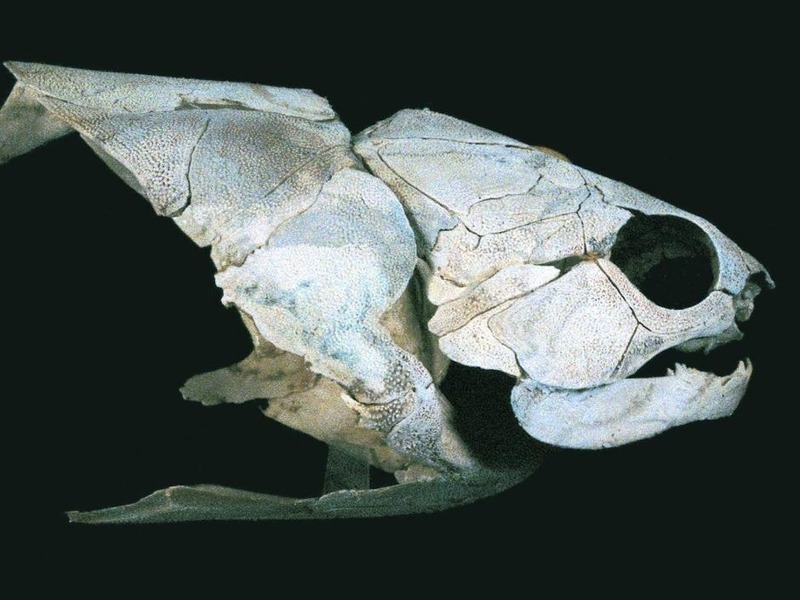 These fish had armored plating along their bodies, and are the earliest-known jawed vertebrates. Despite the bizarre nature of abs on fish, any fitness buff will tell you—it’s probably because they didn’t eat carbs. In Part One of this series, we learned how the mysterious Rongorongo script appeared on Easter Island at a date of unknown origin; in Part Two, we learned about the glyphs and how they’re read. 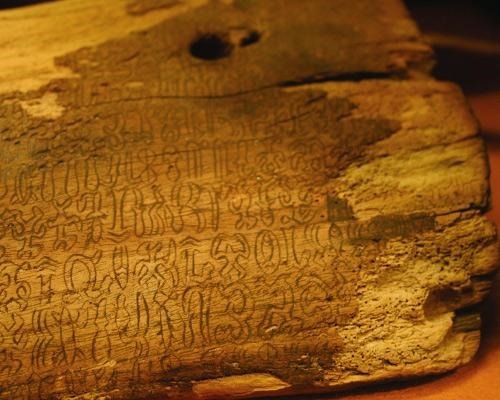 While Rongorongo remains undeciphered, there are plenty of scholars with their own theories on what the texts say. 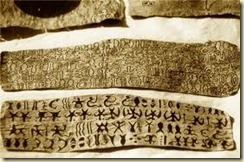 There are about 120 symbols in Rongorongo, and numerous attempts to decipher the texts. One text that we do understand, a little bit, is just a portion from a tablet that contains a lunar calendar. And no one can actually read the calendar. But it’s a start! While it seems like, with today’s modern technology, we should be able to crack just about any code—and isn’t that what a language is? 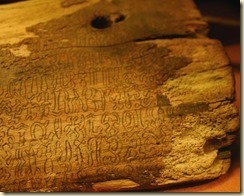 Logical, ordered code!—there are a few obstacles to decipherment of the Rongorongo tabets. One is that there are very few texts remaining to read from, leaving only around 15,000 legible glyphs to work with. There’s also the problem of context! Historians and linguists don’t have accurate contextual information about where the tablets came from specifically, or any illustrations or parallels to texts that they can understand. 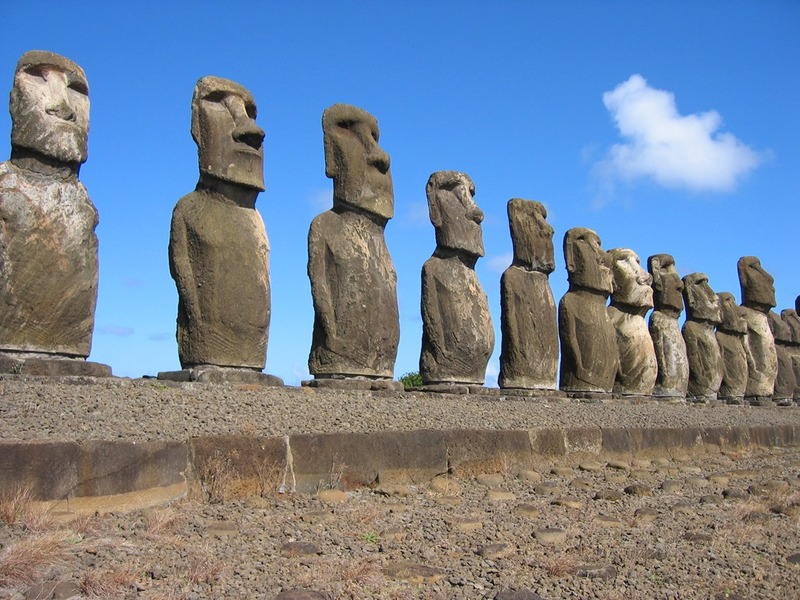 And as if that wasn’t enough, the modern language of Easter Island descendants—Rapa Nui—has been heavily influenced by Tahitian and no longer resembles its previous form (again eliminating any chance of parallels!). What, then, do we know about the tablets’ content? Very, very little. And we may never know! Monsignor Jaussen (1868): Chants about the king & others doing specific tasks. William J. Thomson (1886): Nonsense creation chants, with beings begetting other beings. Dr. Alan Carroll (1982): A priestess flees an erupting volcano and other catastrophes, ending up on Easter Island. However, all of these interpretations have been dismissed in one way other another (particularly the more fanciful interpretations such as Dr. Carroll’s)… and of the many, many attempts at decipherment, none have been accepted as close or even somewhat close to an accurate decipherment. 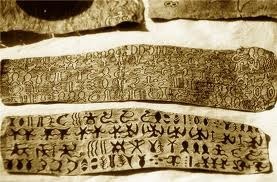 It seems that the Easter Island Rongorongo script may remain one of the world’s unsolved mysteries after all! 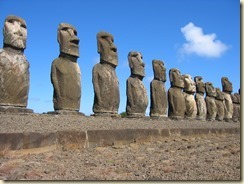 The Other Easter Island Mystery, Part Two: Don’t Use the Rongo Glyph! Terrible word puns in the titles for this series aside, these articles introduce the nearly-unknown script from Easter Island called Rongorongo. In Part One, we learned that no one is quite sure when the script was actually invented, or why! 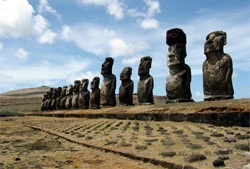 Only that it was forgotten for hundreds of years, and tends to get overshadowed by the island’s giant stone statues. Rongorongo uses symbols known as glyphs to convey meaning through the script, though what the script says…? No one knows! To this day, Rongorongo remains one of the undeciphered languages of the world. What is known is that the glyphs were written left to right and bottom to top in a form called reverse boustrophedon. That means the reader starts at the bottom left corner, reads to the end of a line, then rotates the tablet 180 degrees to read the next line! Yes, that means the line above and below the one you’re reading are upside-down. But if you finish the “page” and flip it over, the line continues from where it left off, meaning it now is read from top to bottom! Of course, the big question here is, what did they do for the giant tablets? You can’t flip those around… so maybe the inhabitants were just really good at reading upside-down script! The glyphs themselves are similar to Egyptian hieroglyphs in that they’re stylized versions of objects or shapes (human, animal, geometric, plant) and can be drawn together to form what are assumed to be compound concepts or words. Birds are common in the script, along with turtles (who seem to have giant ears), fish, and arthropods. Easter Island has a number of well-known petroglyphs, but only a few of these symbols in the script are similar to those! How were the tablets carved? Tradition on the island says that they were cut with obsidian shards or shark teeth, which would have easily created the smooth, deep cuts that form the glyph symbols. Some of the tablets appear to have been cut with a steel blade, however… but these are crudely made, and it’s somewhat telling that steel wasn’t available on the island until after the arrival of the Spanish explorers! While the script hasn’t been deciphered yet, what do historians think it might say? Stay tuned for Part 3…!